This is the absolutely gorgeous wedding of Ashley & Keith, held at the Kirtland Country Club. The Kirtland Country Club is location on the far east side of Cleveland in Willoughby, Ohio. The venue is a spectacular gold club with an amazing club house. It's a wedding photographer's dream. 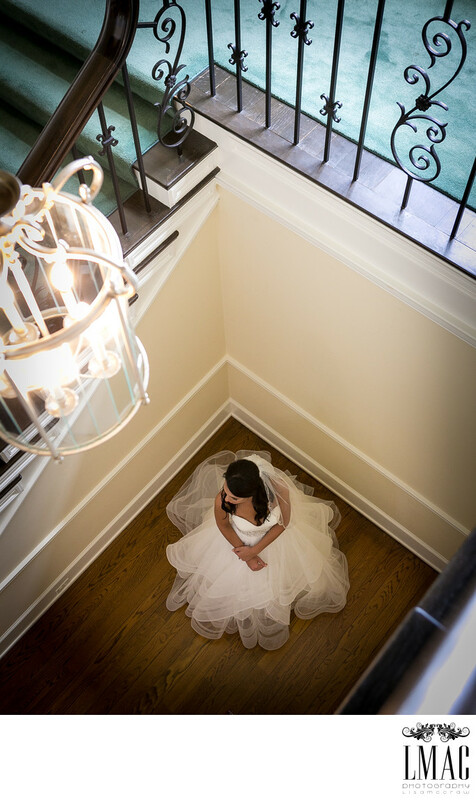 It has a beautiful staircase, spacious rooms for the bride to get ready in, and a gorgeous light filled ball room. The grounds are ideal for wedding photos and the venue is very accommodating to provide golf carts for the bridal party to reach some of the more interesting areas of the grounds. The grounds are woodsy, with a beautiful river bank and bridges. Ashley & Keith conducted both their ceremony and reception at the Kirtland Country Club. The photo was shot at the bottom of the grand staircase in the main area of the club house. Location: 39438 Kirtland Rd Willoughby , Ohio 44094 .